Each year, six million adult patients in the U.S. consult a doctor because of chest pain. This pain may be caused by a variety of factors, including certain diseases (e.g. pneumonia, pneumothorax, or collapsed lung), physical injuries, asthma, persistent cough, acid reflux syndrome or severe cases of indigestion, as well as by defects or diseases pertaining to the heart and/or the blood vessels. 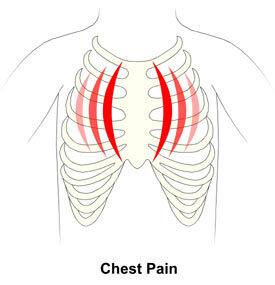 Among the more dangerous causes of chest pain are heart diseases. These may affect the heart muscle itself or the vessels, known as the coronary arteries, which supply it with oxygen-rich blood. If the coronary arteries are unable to do their job properly because of blockages or other causes, the patient may experience chest pain known as angina pectoris. In severe cases, where the blood supply to the heart muscle is significantly disrupted, a heart attack may occur. Unlike adults, children rarely have chest pain that is related to cardiovascular disease. Although chest pain is common in children, it is most often not exercise related. Heart Disease is the number one cause of death in the U.S. for both adult men and women.